The highest level of craftsmanship is what Alka Pool is known for. There swimming pools and spas have won just about every award possible for both commercial and residential pools, hot tubs and water features. Their new website design was a big part of their updated brand in 2014. 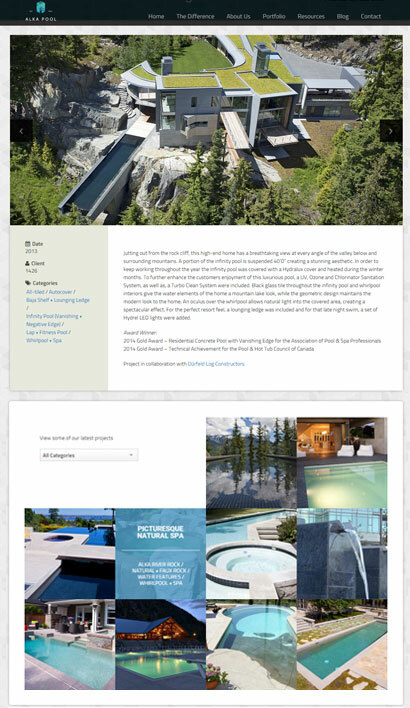 With a new logo and colour scheme the company wanted a new website design that brought their 50 year legacy as the best pool construction company in Western Canada to the forefront but with a twist. With a fairly tight budget and a big wish list the Alka Pool website had to really showcase the quality of work and the incredible pools and water features the company is famous for. It also had to tap into the benefits of building a pool – the personal and emotional reasons for creating outdoor living spaces and pools. This lifestyle aspect was missing from the original site and a need to better connect with the home owner or client was essential. This was a departure from the original content which features images and articles on past projects and information about the company and not the client. The new website design switched this around with a focus on the end result for the client. One of the huge advantages we had with Alka Pool was the tremendous amount of high quality photos available from the client. With so much visual material to work with we wanted a nice method of presenting these images. A portfolio was created with rich media transitions that really bring the quality and craftsmanship of their pools to light. We also catalogued the types of pools to allow for a quick and easy filter system to find the perfect example of an infinity edge pool or beach entry pool. As you view each swimming pool there is a nice “Related Projects” link at the bottom of the page to make it easy for viewers to visit other projects. We included some interesting navigation in this section and incorporated a slide show banner at the top of each project page. It makes for a very rich and meaningful experience for the visitor which is what we set out to do. We also rewrote and created new calls to action on the website that focused on why someone should invest in a pool, the benefits of having the pool experience and sharing that experience with friends and family. While people often talk about building a pool they make the decision based on emotional reasons. This became a new focus of the website design bringing memories and poolside moments forward to the homepage and then leading the visitor into specific sections of the site. There are other nice features on the site that you can view at alkapool.com. A few that we like are the awards section, FAQ and corporate timeline feature. 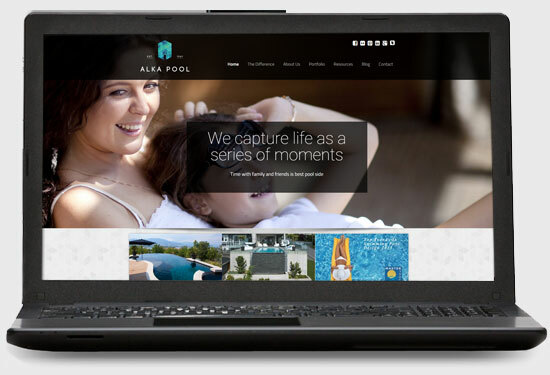 With Alka Pool’s new brand and website design they can now claim to be one of the best online as well as Best Pool in the World Award winners. Please visit the site and see what can be done on a tight budget when great client photography is available and you have the creative experience to bring it all together in a beautiful website design.